Casa Dei Sogni is an air conditioned stone farmhouse resting within a small Tuscan borgo. The house offers high quality accommodation with outstanding views of the Val di Chio and Castiglion Fiorentino from the bedrooms, private pool and terraces. Casa dei Sogni is a newly renovated villa tracing its history back to the early 18th century. Great care and attention to detail has resulted in this lovely home for you to enjoy. 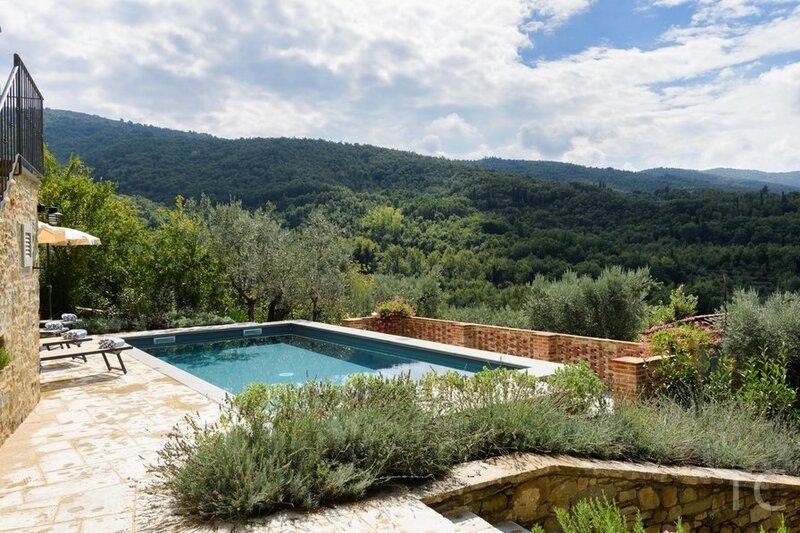 Its hillside vantage point provides outstanding traditional Tuscan landscape views of olive groves, grape vines, along with panoramic vistas of the valley and the distant Tuscan hill towns. The property is part of a small borgo or hamlet providing a great holiday home for 6 guests with three bedrooms, four bathrooms and a private pool. Somewhere for your family or group of friends to unwind and feel at home. Guests at Casa Dei Sogni will enjoy the simplicity of the villa along with the rustic natural beauty of from each bedroom or the garden and terraces. The Villa can be rented for up to 6 guests, and consists of 3 bedrooms, four bathrooms, large modern kitchen , dining area with open fireplace and a small sitting room to relax. The villa offers many features including air conditioning in the bedrooms, WiFi, Apple TV (which can be used independently or via an Ipad or Iphone. to watch favourite movie or TV series), a fabulous fully fitted kitchen (with dishwasher, oven, large fridge freezer, coffee maker etc), small gardens and private pool. The master bedroom suite takes the whole floor and its large bathroom with bathtub overlooking the valley is a perfect start to any day - or romantic evening looking out to the evening vistas and star filled skies…. The second bedroom offers twin beds and easy access to a family bathroom with powerful shower. THe third bedroom with en-suite bathroom, has french windows which give direct access to the pool and terraces. There is also a large garage where there is a washing machine and drying area. Contemporary Kitchen/Dining Room with original stone fireplace. Modern kitchen units housing dishwasher, fridge-freezer, oven, microwave, breakfast bar. Two sets of French doors leading to outside eating area. Bathroom with shower, w.c. and basin with access from outside and inside. Bedroom 3: Two single beds, wardrobe, chest of drawers, two bedside tables, chair. Ensuite bathroom with shower, bidet, wc and basin. Living Room with sofa and two armchairs, side tables and wall inset wood burning stove. Bedroom 2: King-size bed with 2 bedside tables, chest of drawers, triple wardrobe with full length mirror, chair. Bedroom 1: King-size bed with two bedside tables, chest of drawers, triple wardrobe with full length mirror, armchair. Ensuite bathroom with freestanding bath, shower, basin, wc and bidet. All bathrooms have mirrors with lights above, shaver sockets and heated towel rails. All windows incorporate inside and outside shutters and mosquito grills. Outside seating and eating areas, Swimming Pool 8m x 4m with a constant depth of 1.5m. Direct access from the terrace to the Swimming Pool. All seating areas have outstanding views over the Val di Chio. Parking on road or Garage with electric door.